There are many orange tropical flowers for gardeners to grow! All the flowers listed here flourish in tropical and subtropical climates, but many can be grown in cold climates as well. Some plants that grow as perennials, subshrubs, or shrubs in the tropics can be used as annuals in northern gardens, or grown as house plants. 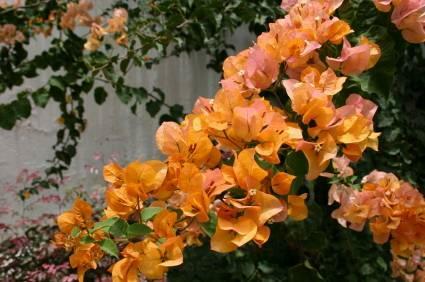 Think of these beautiful orange flowers blooming in your house or garden -- then go ahead and grow them! These pretty plants with thick leaves are one of the very few kinds of annual succulents. They are native to Brazil, Uruguay and northern Argentina and are attractive to butterflies and hummingbirds. They can be grown at the seaside, because they are salt tolerant, and they do well in heat and drought. They grow well in poor, gravelly, or sandy soils, as long as they have good drainage. The flowers come in many bright colors, including red, yellow, white, and orange. Like marigolds, various species of zinnias are native to areas from the southwest U.S. to South America, and may be annual or perennial. Zinnia elegans, the most familiar garden variety, are native to Mexico. They can be grown in a variety of bright colors and are favored by butterflies. There are six Chrysothemis species, but pulchella is the one most often found in cultivation. The leaves are large, deep green, and ornamental in their own right. In the spring and summer, the plant is covered with bright flowers. It grows well as a shade-tolerant groundcover in climates similar to its native Panama and Brazil, and is attractive to butterflies and hummingbirds. In cold climates, it can easily be grown in houses or greenhouses. Cannas are dramatic subtropical and tropical flowering plants that can be as tall as six feet. Some gardeners grow them for their foliage. The large leaves resemble the leaves of bananas and come in a range of green and blue-green shades, stripes, and variegations. The flowers are rather tubular and lily like, and have been bred in a variety of colors. Canna 'Pretoria' (sometimes called 'Bengal Tiger') and 'Stuttgart' are good orange varieties. This beautiful vine can grow as a large, bushy shrub in its native Brazil, as a hanging plant in houses or greenhouses, and as a hedge or as beautiful, vigorous evergreen vines in warm climates. The flowers are small and white with a tubular form, but each is surrounded by three large, papery bracts whose colors depend on the variety of the plant. 'Orange Ice' is a popular cultivar. This beautiful evergreen vine grows quickly and sometimes reaches 30 feet tall. The tubular flowers are up to three inches long and bloom in clusters. This plant usually starts blooming in spring and continues all summer. The flowers attract hummingbirds and butterflies. These brightly-flowered vines are native to Africa. This flowers of this vine are attractive to butterflies and hummingbirds. The stems of this species creep and root, so the vine can become invasive. The stems are hairy. This small shrub has marvelous flowers that are shaped a little like coral branches. It is native to the Phillipines, and should be grown in moist, semi-shaded spots. It attracts butterflies and hummingbirds to the garden. It can also be grown as a potted plant. Celosia species are native to the Americas, Africa, and Asia. Celosia argentea is a small shrub in tropical climates, but is often grown as an annual flower in cold areas. Cultivars form two specific groups. The plumose group has a plume-like flower stalk, while the cristata group has a wavy crest of fused flower stalks.